Presented by FATangel Bookings & Fargo Promotions, Mosh Against Cancer Coventry 2018 will be held on 28th June – 1st July 2018. This will be the third instalment of the annual charity weekender, raising money for Teenage Cancer Trust, which is held at Arches venue in Coventry. After amazing performances at Uprising festival, Amplified Festival plus a killer headline slot at Beermageddon, Thursdays headliners Outright Resistance were snapped up quickly for what will be their MACCOV18 debut. What better way to kick off Mosh against Cancer Coventry! 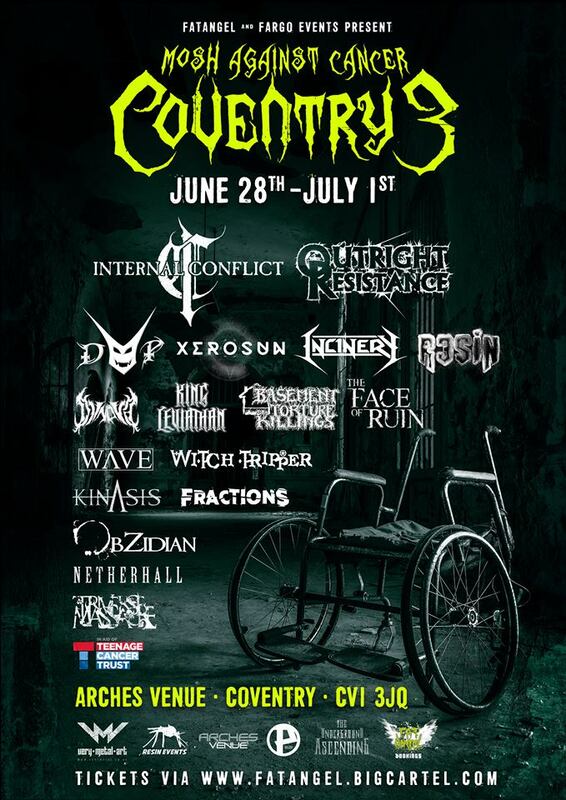 Leicester heavyweight’s Internal Conflict return to MACCOV18 fresh from a UK tour and a performance on the Sophie Stage at Bloodstock Festival. They are set to release a brand-new EP early 2018. Nottingham thrashers Incinery will be taking one of the special guest slots on the Saturday. Dublin’s Xerosun and M2TM Coventry winners Devil’s Playground both take Sunday guest slots. Leicester grunge masters Resin will be appearing as special guests on the Friday. The next band announcement for Mosh Against Cancer Coventry will be toward the end of this year and 2018’s MACCOV will see 30 bands over 4 days performing in aid of a great cause! Internal Conflict Unleash New Video & Reveal Title Of Forthcoming EP!